To top the record-setting turnout at Barack Obama’s first inauguration in 2009, the crowd on the day of would have had to surpass an estimated 1.8 million people. But aerial shots taken during both inaugural events show a much smaller audience for President Trump. 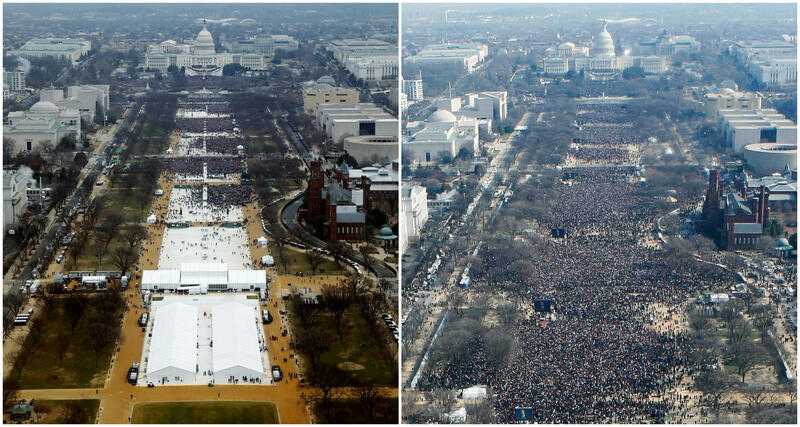 Official crowd estimates are no longer provided, but aerial photos allow at least a visual comparison. And this year, as President Trump takes office with the lowest approval rating of any modern president, the difference appeared stark. Large swaths of clear space are visible, highlighted by the bright white lawn covering which was not used in 2009. Officials were expecting about 800,000 to 900,000 people to come to D.C. for Trump’s inauguration and parade, which is in the same ball park as the estimated one million that attended Obama’s second inauguration. While most reaction online pointed at the comparison between Obama and Trump’s inaugurations, anything close to the anticipated numbers would put Trump’s inauguration above the official estimates given for both President Bushes and President Reagan, none of whom attracted more than 400,000 attendees. Neither is comparing 2009 and 2017 exactly like with like. As America’s first black president, Obama’s inauguration held a particularly potent historical quality, which made it more compelling than other inaugurations. A forecast of rain may also have played a part in the smaller turn-out for President Trump, as would the fact that D.C. itself leans deeply Democrat. The city is also bracing for large crowds throughout the rest of the weekend, with the Women’s March on Washington set to take place on Saturday. It’s the biggest event planned outside of the inauguration. According to the District of Columbia’s homeland security director, Chris Geldart, 1,800 buses registered to park in the city. That means about 100,000 people could be coming just by bus. Nearly 300,000 people have said they will be attending on Facebook.